Jeanie Greensfelder. Biting the Apple. Penciled In, 2012. 58 pgs. $12.50. 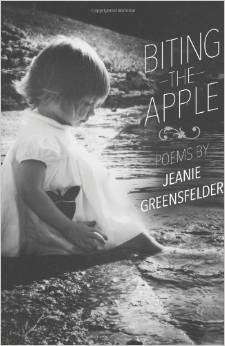 Biting the Apple, Jeanie Greensfelder’s first collection of poetry (and the inaugural publication of Penciled In press), consists of short lyrics that aim to convey the speaker’s fall into knowledge. Many of these poems focus on specific encounters—with the self, with others, with the world—that contribute to the speaker’s self-understanding, the type of memories that rise again and again, demanding comprehension. They trace the speaker’s development from bewildered (and eventually disobedient) child through adolescence and early adulthood to the moment she finds herself in the near present, a woman approaching the status of elderly, if not quite there yet, the grateful companion of other children. The book’s title is, of course, an allusion to the forbidden fruit, the tree of the knowledge of good and evil, the story of Adam and Eve’s disobedience and expulsion from Eden. Apples appear in several of the poems, but the one most directly linked to the theme of Biting the Apple occurs second in the collection. “The Bad Apple” describes the speaker’s father’s purchase of a whole bushel, enough for an entire season. Rather than celebrate abundance, though, the father insists that the speaker eat only bruised apples, perhaps to save the whole batch from spoiling, but the effect is a suggestion of stinginess. The bushel paradoxically creates an atmosphere of scarcity. Finally, alone in the house, the speaker sneaks to the basement and chooses “a perfect apple.” Then, “Upstairs I cut it crosswise / and eat around the stars. / I do not fall / into Snow White slumber. // When my father comes home, / I smile in innocence / and he smiles back, / unaware of my new friend / the serpent.” The most compelling image here is “eat around the stars,” for it is both precise and surprising. Although most readers will anticipate the speaker’s disobedience (for what child, given the chance, would not have disobeyed this father’s instructions? ), readers will nevertheless sympathize with the child’s new knowledge at the poem’s conclusion, that disobedience doesn’t always lead to the dire consequences predicted by the book of Genesis. The most effective poem in the collection, and one which represents Greensfelder’s style at its best, is “Sixth Grade,” recently selected by Ted Kooser for his American Life in Poetry column. The syntax here is straightforward, the vocabulary simple and direct. Yet there is a terror at the heart of this poem, but Greensfelder wisely conveys it through metaphor. Each of the first two stanzas consists of a single sentence, composed without symbol or figurative language: “We didn’t like each other, / but Lynn’s mother had died, / and my father had died. // Lynn’s father didn’t know how to talk to her, / my mother didn’t know how to talk to me, / and Lynn and I didn’t know how to talk to each other.” So the two don’t talk; instead, they create a game: “A secret game drew us close: / we took turns being the prisoner, / who stood, hands held behind her back, // while the captor, using an imaginary bow, / shot arrow after arrow after arrow / into the prisoner’s heart.” These final two stanzas acquire their power from the imagery, the straightforward language and syntax, and also from Greensfelder’s choice simply to dramatize the game, concluding the poem without a gesture toward explanation. Occasionally the poems do explain a bit too much for my taste. For example, in “The Bad Apple” quoted above, the phrase “in innocence” could be cut, a deletion that would intensify the poem’s complexity, I think, without creating any confusion for the reader. In some of the poems, the language could be tighter, becoming more memorable through compression. “Knitting” begins with this stanza: “I hold out my arms. Mother / puts coils of yarn around them. / Starting with a thread, / she winds ball after ball, / colors for her afghan.” If the second line read, “coils yarn around them,” would anything be lost? I don’t think so, and then the most interesting word in the line, “coils,” would both acquire the significant position of first word in the line and also function as the verb, enhancing its imagistic power. On the other hand, the first line is remarkable for its enjambment. How much more effective it is to break the line after “Mother” than it would have been to simply follow the grammar of the sentence—many poets would have begun this stanza, “I hold out my arms. / Mother puts coils of yarn…” Greensfelder’s choice illustrates the significant difference poets can create by attending to the structure of the line as well as the grammar of the sentence. We see the child holding out her arms to Mother here, although the sentences suggest a separation between the child’s gesture and the mother’s action. Greensfelder’s poems challenge us to consider the contributions of ordinary speech to literary language, a discussion that has been ongoing for at least forty years and is likely to continue as contemporary writers infuse their work with allusions to pop culture and classical culture simultaneously. This discussion actually begins with a consideration of audience and then leads to debates about accessibility or exclusivity, a debate I do not care to enter into here. Greensfelder achieves accessibility, and Biting the Apple would be a good collection to hand to any person who claims not to be able to understand contemporary poetry. This entry was posted in A Review A Week on July 6, 2014 by Lynn Domina.